102 min. Sony Pictures Releasing. Director: Paul Weiland. Cast: Patrick Dempsey, Michelle Monaghan, Beau Garrett, Sydney Pollack, Kadeem Hardison. My Best Friend's Wedding gets an unofficial remake in the tired rom com Made of Honor. Not much distinguishes this determinedly average Hollywood outing, but it can claim Sydney Pollack's final performance and Patrick Dempsey's first big-screen starring role since his career second-wind on TV's Grey's Anatomy. Other good actors tread water here (Michelle Monaghan, Kevin McKidd, Kathleen Quinlan, Busy Philipps, James Sikking) to keep their heads above airless material, and director Paul Weiland (City Slickers II: The Legend of Curly's Gold) likewise does his best to prop up a problematic script credited to three screenwriters. Like most such movies, Made of Honor hedges its bets with attractive leads and attractive locations (in NYC and Great Britain). Dempsey plays Tom, a player devoted to sleeping around but also to his best friend Hannah (Monaghan). Hannah needles Tom for his sexual profligacy, but after she goes on holiday in Scotland, Tom realizes he can't live without her without going crazy. It must be love, but before he can propose, Hannah returns with a fiancé (McKidd) in tow and asks Tom to be her maid of honor. Oh, the emasculation! And oh, the hilarity as Tom determines to stop the wedding not by simply telling Hannah his honest feelings and having it out one way or the other, but by attempting to undermine the impending marriage from within the wedding party (with predictably disasterous results) and then telling the truth—guess when? Yes, of course, there'd be no movie without these plot contortions, but perhaps that'd be for the best instead of rehashing the increasingly deadened wedding-themed romantic comedy. Some people will never tire of seeing the same comedic beats replayed, but while Made of Honor may not be cringe-worthy per se, it never breaks out the laughs either. Pollack proves the most memorable as Tom's uninhibited, oft-married father, but the rest of the "shenanigans" blandly fail to make the case that the likeable stars can save a misbegotten premise. 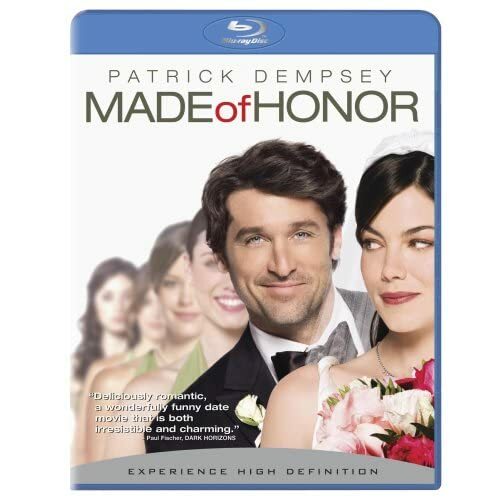 Sony's Blu-ray release of the recent Made of Honor includes a generally gorgeous visual rendering and a Dolby TrueHD Surround soundtrack pleasantly overqualified to handle the romantic comedy's dialogue, music, and mostly mundane ambient sound effects. One of the strengths of the film is its location photography in Great Britain and New York City, and these scenes particularly shine with dimensionality on Blu-ray. There's a bit of haloing evident on occasion, but on the whole, this is a very nice AV presentation. The Blu-ray and DVD versions share a few moderately interesting extras. I was surprised to find the audio commentary with director Paul Weiland a rather charming way to view the film, arguably more entertaining than the film itself. Weiland makes a great host, chatting amiably about how the film came together, production and story challenges with an ever-evolving script, and the cast, about which he tells the odd tale out of school (including one about one of Kadeem Hardison's inexplicable acting rituals). 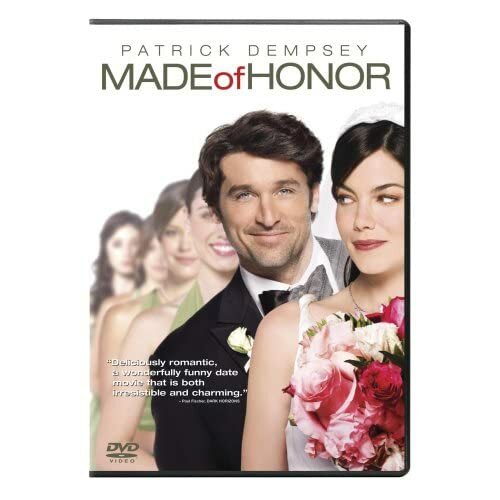 "Save the Date: The Making of Made of Honor" (12:54), presented in HD on Blu-ray, is ever so slightly a cut above the usual EPK due to its interesting behind-the-scenes glimpses of location shoots, as well as Sydney Pollack and Patrick Dempsey hanging out on set or developing a bit (like Dempsey's plate-juggling). Mostly, it's a run of talking heads including Weiland, Dempsey, Pollack, Michelle Monaghan, executive producer Callum Greene, director of photography Tony Pierce-Roberts, production designer Kalina Ivanov, and Kevin McKidd. The HD featurette "Three Weddings and a Skyline" (6:49) has Ivanov, Greene, Weiland, and Pollack on hand for a closer look at the production design of the three wedding sequences. Sony also serves up a couple of brief Deleted Scenes in standard definition: "Locker Room" (:38) and "Highland Games" (2:36). Lastly, the disc includes fourteen previews and a BD Live hookup to access more content online. All site content © 2000-2019 Peter Canavese. Page generated at 04/23/2019 07:39:40AM.